At Schenck & Company, we pride ourselves on environmental consciousness – in all aspects of our business. Though it may seem at first counterintuitive, we understand that wood is, by nature, among the most sustainable of flooring materials. Good forest management makes it possible to harvest hardwoods with minimal impact on the environment. And the energy used to create wood floors is substantially less than to create most other flooring. Yet at Schenck & Company, we go several steps further in the quest to be green. Wax and oil finishes are the preference at Schenck & Company. Not only do these environmentally friendly finishes provide a warm patina that won’t yellow over time, both wax and oil finishes are more easily repaired and renewed than polyurethanes, which often require sanding or chemical stripping to look their best. Whenever possible, we use locally milled materials for the floors we design and install. In fact, we were one of the first companies in Houston to embrace Texas mesquite. This used to be considered a “trash” wood but its extraordinary durability and interesting character make it an ideal choice for many homes. 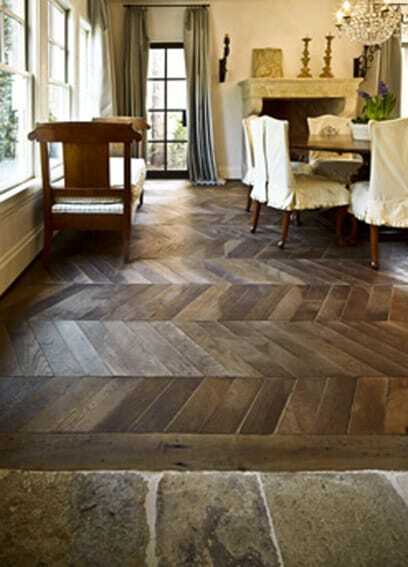 Many times a damaged floor can be restored to its original beauty rather than replaced. Schenck & Company has had significant success drying and repairing water-damaged floors that many companies would consider unsalvageable. Not only is repair more environmentally friendly than replacement, it’s budget-friendly, too. When the style of an installation allows, we use flooring milled from reclaimed lumber – pulled from one location and repurposed for another – to stunning effect. Wood can come from just about anywhere: barns, warehouses, gyms, even old ships. Not only is this an ecologically conscious choice, it’s a beautiful way to add character and history to a room. We do our best to run a eco-friendly company, recycling everything from paper to plastics, metal to motor oil and filters, even wood dust. That’s our commitment. And just one more way, we’re doing our part for a greener, healthier environment. To learn more about the environmental benefits of wood floors, click here.